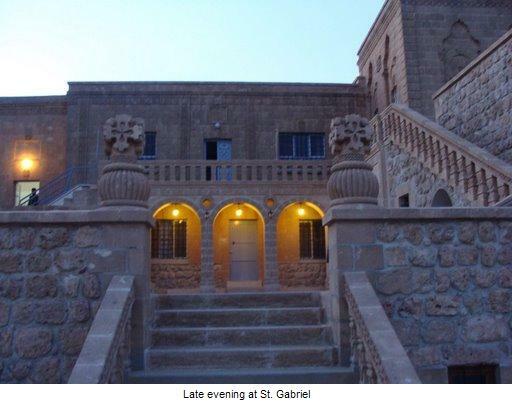 Tur Abdin, Turkey (AINA) -- The St. Gabriel Assyrian monastery, in Mardin, Turkey, won the first of three court cases today. The dispute centered over land owned by the monastery and three surrounding villages. The Turkish state brought the case against the monastery on behalf of the villagers, who claimed the monastery had illegally encroached on their lands. In today's ruling, the presiding judge decreed that 110 hectares (272 acres) of monastery land which was awarded to the villages by the Turkish land registry belongs to the monastery. Two other cases are pending against the monastery, the "Treasury" land claim and the "Forestry" claim and will be adjudicated on June 17. On June 24 the case against Kuryakos Ergün, an individual, will be tried for the "intentional violation of the Forestry law." AINA attempted to speak to the heads of the three Muslim villages that brought the suit against the monastery, but the heads refused to comment on the verdict, only saying that they may appeal the decision. A Turkish official at the Ministry of foreign affairs, who wished to remain anonymous, said that they also feel relieved about the verdict since the court cases "caused a lot of headaches for those that work on Turkey's European Union membership." Many European politicians were at the trial as observers. The Swedish-Assyrian parliamentarian Yilmaz Kerimo stated: "It is unbelievable that lawyers can behave like this, like if it was some kind of game," referring to the fact that lawyers for the state delayed the trial because they had to visit a Mosque and pray before coming to court. News of the verdict was greeted with jubilation by the Assyrians in Midyat and in Assyrian communities throughout the world.